I identified the instruments – two flutes, cello and piano, and understood to what I was listening for the very first time. 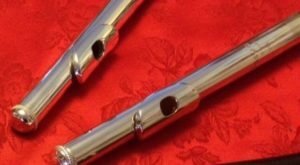 About three years ago I was contacted by Ra’anan Eylon, who studied with flutist Hanoch Tel-Oren. Ra’anan found the manuscript of the Concerto for Two Flutes, Cello and Piano, Op. 262 that Lavry wrote for the flutist duo Hanoch and Sharona Tel-Oren in 1956. I reviewed the sheet music and it was indeed the lost recording of the concerto! I would like to share with you this charming recording that embodies many of Lavry’s characteristics – lyrical, humorous and an extraordinary orchestrator. This is the original recording by the Dalet Klei Shir quartet, whose members consisted of flutists Sharona and Hanoch Tel-Oren, cellist Yitzhak Blassberger and pianist Nelly Ben-Or. Tomorrow, March 24, 2017, will mark the 50th anniversary of the passing of the composer Marc Lavry. It’s amazing how his works continue to surprise us.